Hojai Police on Monday seized a huge consignment of ganja weighing 198 kgs from near Hojai Railway Station. Two youths were arrested in this connection for their alleged involvement in smuggling of cannabis. The accused have been identified as Jaykant Roy and Basu Debnath. 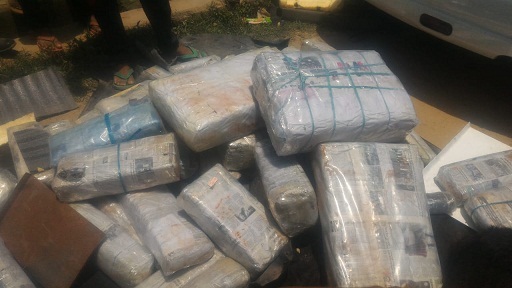 According to police, the consignment of cannabis was brought from Dimapur to Hojai. The smugglers were supposed to take the consignment to Guwahati through a Swift Dzire vehicle (Registration No AS 01 AT 8539) with the help of Basu Debnath, the driver of the Swift Dzire. The Railway Police on April 28 last seized a huge consignment of ganjas from the Chandigarh Express coming from Dibrugarh at Guwahati Railway Station. The consignment of ganjas weighing 40 kgs was recovered by the Railway Police from a toilet of the Chandigarh-bound train. The Government Railway Police (GRP) during a raid on March 2 seized 30 kgs of ganja at Guwahati Railway Station from Tripura Sundari Express.